FIGURE 6.2 (A) S. glutinosa flowers with B. hortorum leaving a flower after a visit; original habitat near Eichstetten. (B) S. sclarea visited by X. violacea (private garden in Schwanau). sensitive force transducer (Burster Präzisionsmeßtechnik GmbH, D-76593 Gernsbach, Germany) and a retractable tube behind the posterior wall of the construction. The retractable tube contains a sugar solution (apiinvert, Südzucker AG, D-97195 Ochsenfurt, diluted to 50%) as a food source. The posterior wall is covered by a foam pad with a central hole giving access to the tube with the sugar solution. As the bees are feeding, the thin tube containing the sugar solution is manually retracted. By trying further to reach the food source, the insects start pressing their heads against the foam pad. 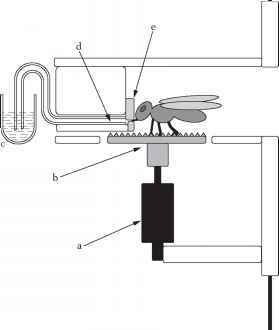 The induced reactive force is transmitted via the bees' legs and the platform to the force transducer that measures this force with an accuracy of ± 50 ^N. The force transducer converts the forces into a voltage output, which is stored online by a laptop computer. 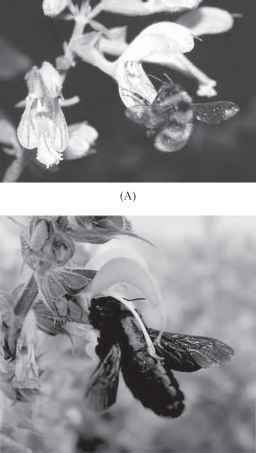 The tested bumblebees were continuously fed with air-dried pollen, and the supply of the colony with sugar solution was interrupted 24 hr before the experiments were started. Siona lineata Plusia gamma Hemaris sp. 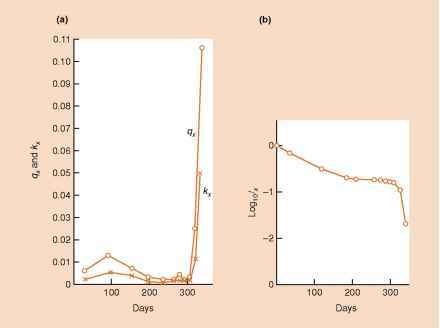 Source: Data was obtained either from the literature (21,32-34,41,50-57) or from this paper's authors, represented by X. Activity by the flower visitors was evaluated by the respective authors or was based on descriptions from the references: + pollinator; 0 visitor (or no details given); N nectar robber; n nectar thief; p pollen thief; [ ] the original author used a synonym. FIGURE 6.3 Schematic drawing of the artificial flower, a custom-made device for measuring forces exerted by insects to gain access to a food source (for description, see the text). (a) force transducer, (b) base plate, (c) sugar solution, (d) retractable food source, and (e) foam pad.